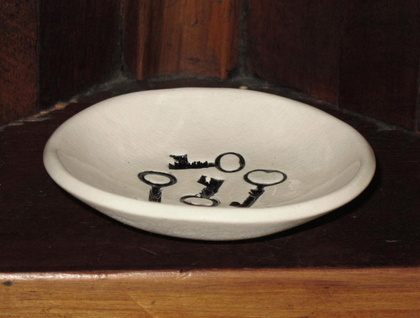 This little ceramic dish can be used for a variety of uses - loose change, rings & other jewellery, keys, treats... 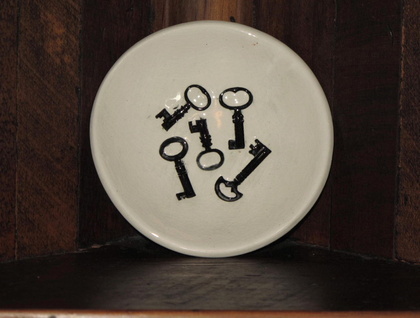 It features 5 deeply impressed antique key patterns. The keys I used are authentic and part of my collection. It measures approx 9 cm round x 2 cm deep. It has a beautiful fine clear crackle glaze finish with a distressed black underglaze. Each bowl has a circle of cork on the base to protect your surfaces and keep it in place. Mudbird Ceramic Ware is perfect as an original gift. Each piece is hand cut from NZ White Clay, then stamped/impressed using a mixture of new & antique textures, stamps woodblocks & found objects. After drying & smoothing they are fired once, under and top glazed then fired again. This makes the perfect gift, and will arrive beautifully wrapped. Please visit my Facebook page to see more DISH designs in different glazes and textures. Contact mudbird to enquire about payment or shipping options.